The Pool Doctor is a full service swimming pool company specializing in inground vinyl lined swimming pools. The Pool Doctor does not use any subcontractors; all work is performed by Pool Doctor employees. All of our pools can be customized to fit your backyard space, including making the pool a bit longer, shorter or wider, etc. That is part of the beauty of a Pacific Graphex pool. View the examples below to see the many pool shapes we have to offer. Every pool comes with a transferable Lifetime Warranty. Any Pacific Graphex Pool can be made to any size! Design a custom pool to make your dream a reality! Build these sizes or we can custom design your pool! Have a different size in mind? Let us customize it to fit your dreams! Custom design the size that's the perfect fit! Design this shape into any size you can dream! 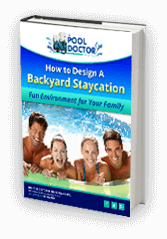 Design your dream pool! Customize the size. Or design the size that's the perfect fit! Let us customize this pool for you! You specify the width & the length ... and we'll design it! Just let us know the size you would like and we'll make it happen! 16'6" x 23'6" x 42' 6"
Custom design your dream pool! Design your dream pool. A 4-Leaf Clover, an Hour Glass. Let your mind roam free!